London Midland Region and Western Region Blue Pullman Trains, Tri-ang style. Click on vehicle photos for a larger image Use browser "BACK" button to return. 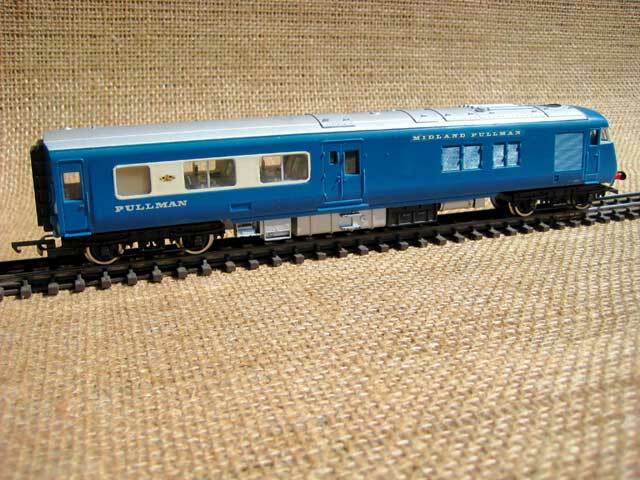 With all the model media attention in Blue Pullman models recently, why not have a London Midland Region six car and a Western Region eight car Blue Pullman train now, with reasonably correct looking vehicles and without too much effort or financial excess? 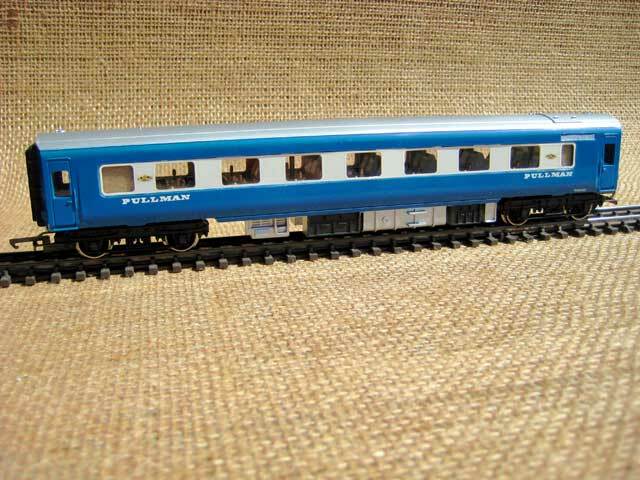 A completely new 00 scale Blue Pullman train, built to 21st Century DCC compatible fine scale standards, retails today for a not insignificant several hundreds of pounds. Here then is one practical and economic solution to creating both of these prestigious trains and as a bonus, achieving the satisfaction of having modelled the trains yourself. Now for the disclaimer. 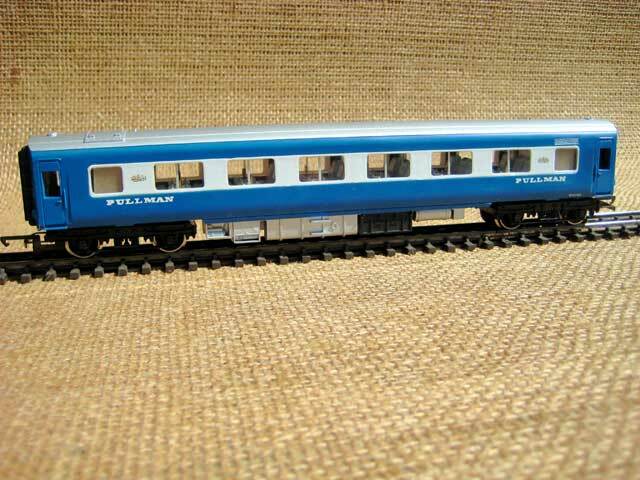 This simple and inexpensive adaptation is not intended to produce accurate 21st Century standard fine scale super detailed models of Blue Pullman trains but models that will blend in with other contemporary Tri-ang Railways vehicles of their period. Importantly, all the vehicles retain their original Tri-ang Railways Mk.III tension lock couplings at both ends. The two train formations are therefore both practical and resilient, they will run well in either direction and the trains are easily put together because of the automatic couplers. The trains are also easily disassembled for off layout storage. The original Tri-ang Railways models are readily available on the used models market today either at model shops specialising in pre-owned models, at swapmeets or on eBay. As the vehicles are being modified, there really is no need to purchase expensive pristine boxed examples as reasonable play worn models will meet all the requirements. The original X3121 power bogie is adequate to power an eight vehicle train and it will run smoothly on present day Code 100 track and points. In a few cases though the wheelset back to back dimension may require a slight adjustment. As all the unpowered bogies have wheelsets with pinpoint bearings, these also run smoothly. A bit of background on the original Tri-ang models. 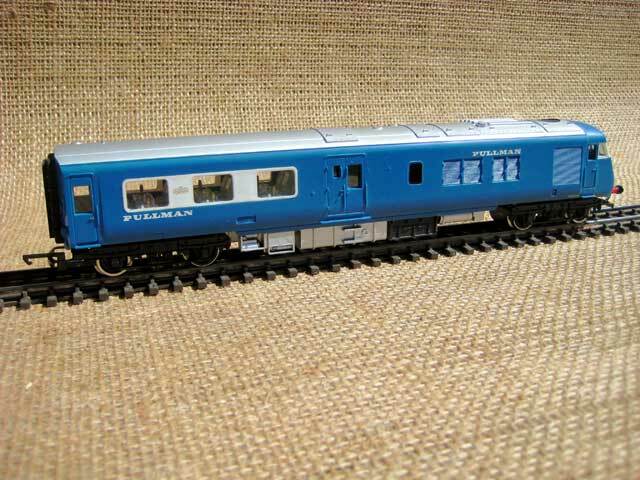 In the 1963 Tri-ang Railways catalogue a stunning new model was illustrated, the Blue Pullman diesel electric train or sometimes referred to just as the Diesel Pullman. The items illustrated were a powered (R555) and unpowered (R556) Motor Brake First car and a Parlour First car (R426) representing two out of the three types of vehicles that were included in the two six car trains that were operating on the London Midland Region between London and Manchester. As was a typically irritating habit of Tri-ang Railways, perpetuated by Tri-ang Hornby and sometimes even today by present day Hornby, a complete compliment of vehicles permitting the correct formation of the trains was not offered. In the case of the Blue Pullman train, the Kitchen Parlour First car was conspicuous by its absence. This extra car would not have been all that difficult to include in the range at the time as the vehicle would have shared many parts with the Parlour First Car thus permitting the correct make up of a London Midland Region six car set. Because of the ingenious design of the vehicles in having flush glazed insert window strips, the only basic additions required would be new window strips for the additional cars, some add on parts on the roof above the kitchen and a car interior. Unfortunately, when the Tri-ang models reached the market, the power cars were not as originally illustrated in the 1963 catalogue. What did eventually appear was a Motor Brake Second as operating in the eight car sets on the Western Region. 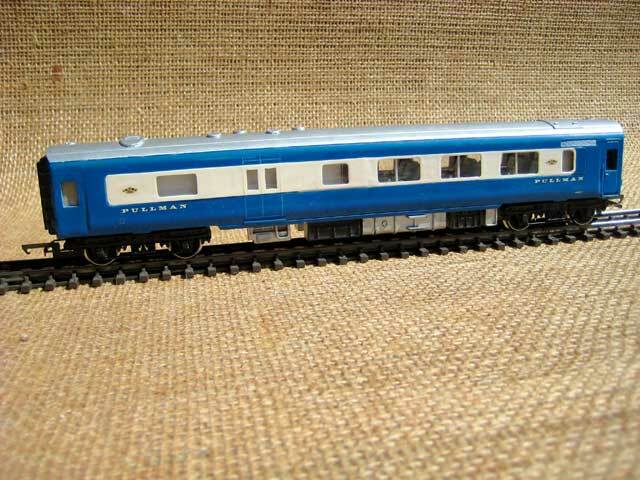 Why this deviation was made is completely illogical as the original format of Motor Brake First plus the Parlour First and Kitchen Parlour First car would have permitted a true representation of the London Midland Region Blue Pullman six car train. With the Western Region power car now produced for inclusion in an eight car train, the Kitchen Parlour First would still be required along with an additional vehicle, a Parlour Second. 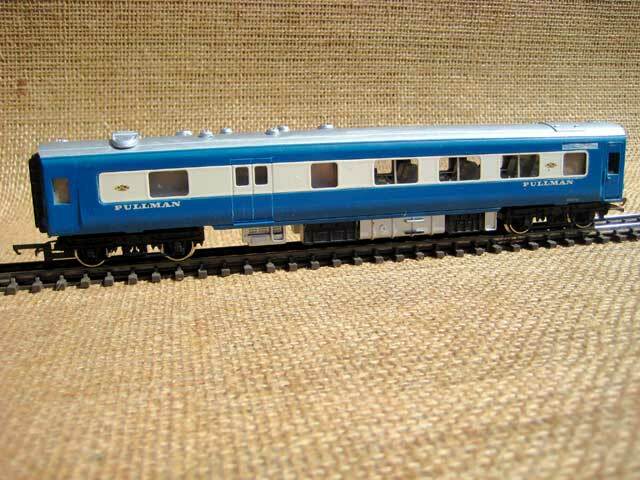 Anyway, enough of the philosophising, how do we make up a reasonable representation of both types of Blue Pullman trains, Tri-ang Railways style? Note that the following procedure applies to the original blue and white models only and not to the later grey and blue models nor the blue and grey models with the full length grey stripe. These later versions have a different body moulding and do not have the removable flush glazed window strip. The most practical train to fit on to a layout is the six car London Midland Region set. We are one third of the way there as the two original Tri-ang Railways Parlour Firsts (Type 6) require no alteration. Two pairs of vehicles do require modification though and these are the conversion of two Parlour First cars into two Kitchen Parlour First (Type 4) cars and the two Motor Brake Second power (Type 2) cars into Motor Brake Firsts (Type 1) cars. Fortunately, the construction of the Tri-ang vehicles produced makes it readily adaptable for modification. Since discarded parts from the Kitchen Parlour First conversion are used to create the Motor Brake Firsts, the Kitchen Parlour Firsts should be done first. The window strips, having been designed to give a flush glazing effect, are removable from the carriage body with just a little patience and care. For the two kitchen cars, this was done and the window strip cut in half. The half representing the kitchen area was replaced by a piece of plastic card that had the new window arrangement carefully cut out and shaped. The original half and new window strip were plastic welded together and smoothed down. Once set, the window strip was painted and reinserted on to the carriage body making sure the kitchen end was at the other end from the rectangular roof hatch. There are no exterior passenger doors at the kitchen end of the cars as the windows there are for a crew toilet and staff room. The door fittings were removed, the openings smoothed in with filler then painted over in the standard colour of Nanking Blue. For the interior, the seat unit was cut in half and a kitchen partition was constructed from plastic card. No kitchen detailing is required as the kitchen windows are opaque. Roof detail of the additional ventilators above the kitchen area are applied by pieces of suitably shaped plastic card and painted with Floquil Amtrak platinum mist paint. The Motor Brake Second cars were modified in a similar manner to the Kitchen Parlour First cars, replacing the three second class spaced passenger windows with two first class spaced passenger windows and a toilet window from the end left over from the conversion of the Parlour First Cars to Kitchen Parlour First Cars. As these window pieces are slightly longer than the originals, some plastic surgery is required to lengthen the slot required for the insertion of the new window strips. Two seating bays were cut off from the three seating bays left over from the first class spaced seat unit made surplus from the kitchen conversions and inserted into the power cars. The London Midland Region cars do not have side destination panels so by painting them Nanking Blue to match the car body colour, they may be made to appear unobtrusive. For a Western Region train, again two pairs of vehicles require modification. The two Parlour Kitchen Firsts (Type 5) are done as for the London Midland set and the two Parlour Second (Type 3) cars are made by completely removing the glazing strip and replacing it with a seven window insert. As an alternative to cutting out all the windows yourself and to make things even easier, excellent ready formed window inserts and roof detail conversion packs for all the Tri-ang Blue Pullman vehicles are available from Southern Pride models. The seat units saved from converting the London Midland Region power cars from seconds to firsts are joined up along with a single seating bay to make the seven bay interior of the Parlour Seconds making sure that the seating is correctly orientated relative to the roof hatch. As made by Tri-ang Railways, the power cars are seconds and you would expect that they would be correct and ready to use for the Western Region set. Well, that's not quite the case. An error has the seating unit placed the wrong way around arranged as 1+2 across instead of 2+1 across as viewed internally from the passenger door end. The reversal of the seat units is quite straightforward. Decals, available from Fox Transfers, are replaced as required and that's it, a complete London Midland Region and a Western Region Blue Pullman train that we all wished that Tri-ang Railways had made for us way back in 1963.